I was absolutely rubbish at poaching eggs. There is no way I would have ever considered basing a starter for four around a poached egg. That was until I bought some beautiful, fresh stems of asparagus and spotted some big fat duck eggs the day before our visitors arrived last weekend. So I gave it a shot. And it worked! Thank you to Elise for the poaching method! A recipe isn’t required here. Melt some salted butter gently in a pan, add a generous amount of chopped chives and set aside. 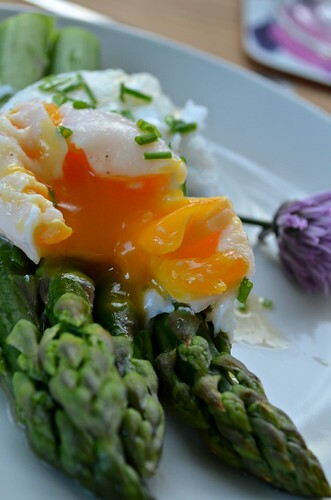 Poach a duck or hen egg (like this) and blanch 4/5 fat spears of asparagus per person. Each should take 4 mins to cook so you should start them at the same time. 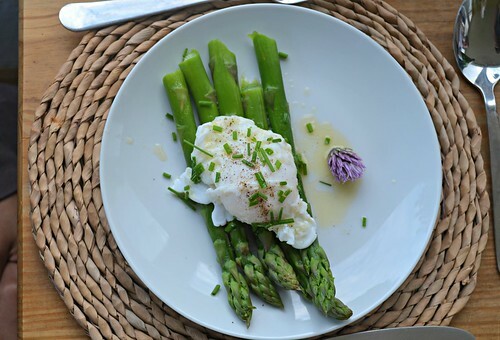 Drain the poached eggs well (I failed here) and serve on top of the asparagus drizzled with the melted butter and some more chopped chives. The simplest, freshest foods are always the best. Beautiful! Thank you. I spot a gorgeous purple chive flower too (: there’s nothing better than simple food, made from fresh ingredients at their peak. Simple and beautiful. Very well done!